Susie Harris: Wanna know where starfish play? Star Fish are one of my favorite things in the whole world. I just love them. I have a few in my laundry room and when I make over the bathroom there will be a heap in there too. love these! 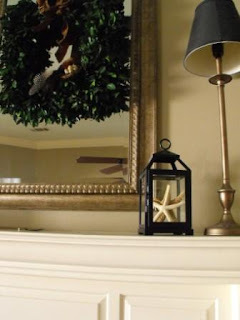 great to decorate with to get us all out of the winter slump. 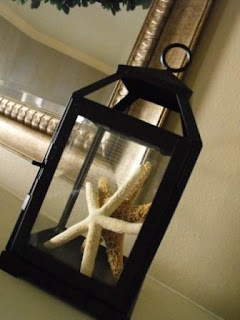 great idea to put them into the lanterns! You have a whole university of star fish....they are so pretty! So cute! We don't decorate with starfish here in the fridgid Mid-West. It made me think of warm vacations! LOVE THEM! I was just thinking the other day that, come spring, I was goint to get scads of them and scatter them around the house! These guys play all over my house too. I do have to separate them though when they get too loud :) I've found that mine prefer to play in moss. Great pictures! So pretty! 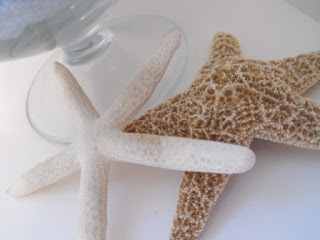 I'm daydreaming that I'm at the ocean picking up starfish to come live at my house:) Of course, if I'm daydreaming I suppose it should be a beach house!! Funny! 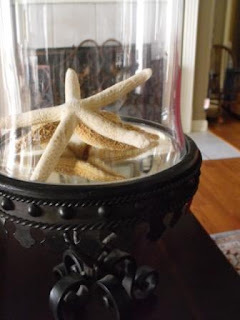 Are those the same two starfish traveling around your house or do you really have that many? No matter...I love them and must have some immediately! So cute. I see that you are a fan of the ocean. Do you live near it? They add just the right touch! Love how you've placed them all! Hi Susie! What a cute entry. 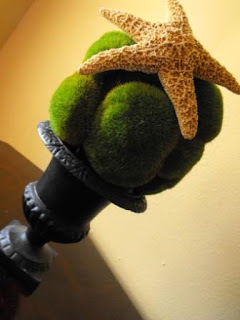 I personally like the star fish hanging out on the "mossy" topiary. That cracked me up! 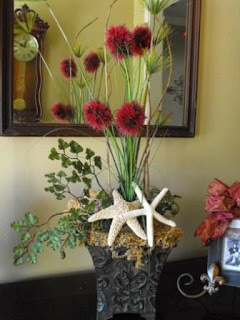 I love starfish...and I think they fit with every season, so they're a great decorating accessory! Where did they end up staying? Stop by and see my new blog. I thought you had tons of them! 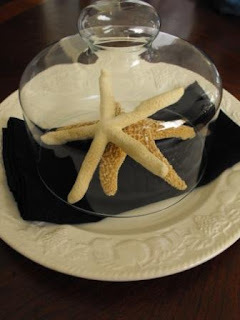 I've seen starfish all over - think I might start getting some! I have seen several magazines that are showing a lot of starfish...must be quite popular this year. I love them and of course, will have to get some. 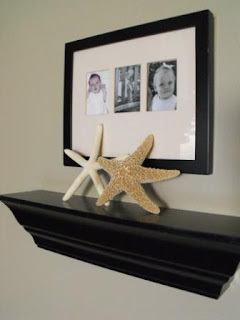 When I was at HomeGoods last Saturday they had a bunch of beautiful beachy type pictures that would look so good with the starfish. I might do a bit beachy this summer! Makes me long for summer. But I can't even begin to think about such things when it is exactly 10 degrees here today. Did you hear that? 10 degrees! And it's supposed to get even colder tomorrow. 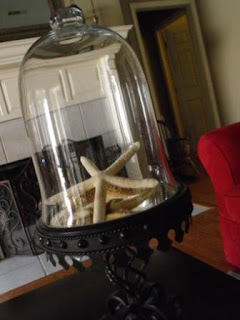 I absolutely love starfish as well and have them all over my house. This was a cute post - it was like watching two little starfish having an adventure. OK, I sound like a dork now. But you know what i mean! I love this idea! I need some starfish!! Ver cute idea, Mrs. Susie! I need to fine one of those apothacary thingies!! I just recently re-did my laundry. It's so nice to have a wonderful room to do the laundry in. I know that you will love doing your laundry now! 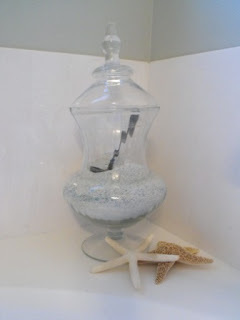 Here is my post from when I did my laundry room. They sure do get around! Just thought I'd let you know that I received my plaque...I love it. You did a great job, thank you! You're so funny! I love them everywhere! it's amazing what you can do when you get creative...love it! What a fun post! I think I will post about starfish tomorrow! THANKS for the idea!!! 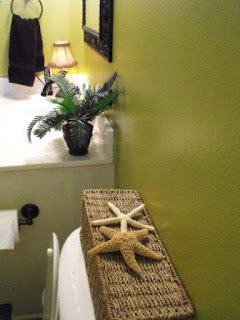 Love what you did with the starfish. It looks great! Oh that reminds me of summer.....Love all your ideas. 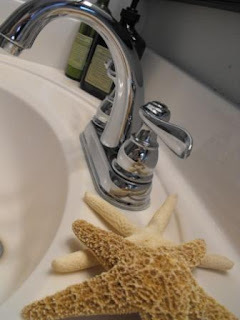 You know...I was thinking you sure have a cool starfish collection. LOL! Can't decide which is my favorite place you had them. So, where did they finally end up? How cool, and ironic. I just recently got a suggestion to alter my star ornaments to include beachy looking glass - voila! Starfish! Those two sure get around. They look beautiful EVERY where you have them! Have fun at Blissdom...how AWESOME is that!!!! I love starfish too and seashells!! Thank you for the blog advice and for entering my giveaway! Please come back and visit soon. Hey, I may see you at Blissdom...I'm still deciding if I want to make the 6 hr drive. That was a fun way to get us all thinking of warmer months ahead. Cute, Cute, Cute! I love it! Very nice, do you live in a warm climate? It's hard for me to use shells in the winter because I'm home right now because of the wind chill. It looks like you had fun playing with the starfish. I need some inspiration for my bathroom. This was great! Clever you! 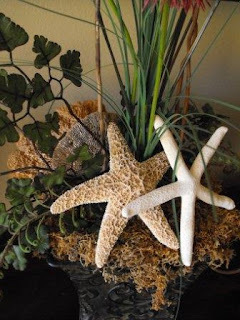 There something about a starfish that brings a "wave" of great beach memories and they're just plain cute too! Im following you and so happy I am..